When the pet, named Albert, passed owner Shane Dunne wanted to mark the solemn and traditional toilet flush with a special ceremony. With his tongue firmly planted in his cheek Shane placed Albert in a match box - he says he couldn't afford a bigger coffin - and brought the fish to the bathroom. Capturing it all on Snapchat the owner also brought some of Albert's goldfish friends along for the occasion. And no funeral would be complete without a speech from a priest before Albert was flushed away to the sounds of a bagipe. He has now gone to that great glass aquarium in the skies, no doubt. 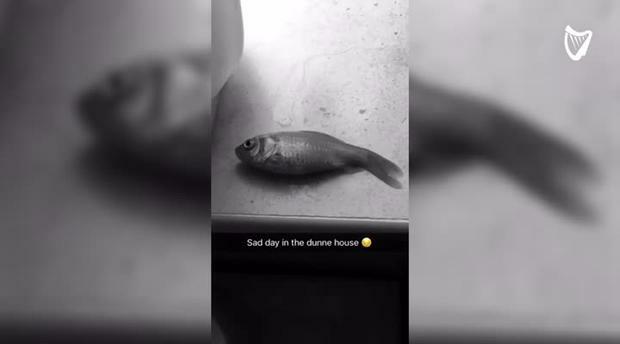 Shane's brother Oisín explained that they bought the goldfish as a present for a meal in 2016 and they had "shared great moments and will cherish the memories that go with Albert on this dreaded day".